Is A Rebounder the closest thing you can find to the Fountain of Youth? 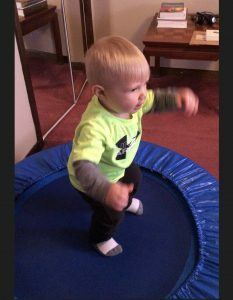 Rebounding on a mini trampoline is making a difference in our lives – only one month in (at the time writing this)! One thing that stood out in our research was the statement above. Here on AntiAgingByDesign.com we believe in Training the Body (keeping active) – and also Training the Brain (mindset and thoughts) and Training for Nutrition (what you feed your cells). 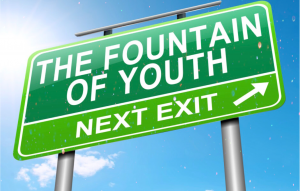 So we believe all 3 take you closer to the Fountain of Youth. In the keeping active department, we are liking rebounding! We mentioned toward the end of February that we started rebounding on our new Needak rebounder. We upgraded to this brand after researching more about the health benefits of rebounding. Our rebounding journey began many years ago. Reading now that it was popular in the 1980’s after NASA started using it as an effective way to help astronauts recover and regain bone and muscle mass after being in space, we’re thinking that’s when we first bought a mini trampoline for its muscle and bone benefits. We try to stay ahead of the times, and that’s when we were also introduced to Shaklee Nutrition that was ahead of its time. Do we ever wish (now) that we had stuck with rebounding. We did not have the internet then and did not have access to information about all the health benefits you can get when you rebound and so we must have lost interest. We’re not even sure where the current rebounder we had in the basement came from or when we got it. We just know we hadn’t been using it, and knew after examining it that it wasn’t a good quality one. Reading a book that mentioned the Fountain of Youth statement sparked our interest and so we started doing more research. What we are learning about rebounding is that there are quite a few health benefits. One major difference in rebounding over jogging/running/jumping on concrete or other surfaces, is the lower impact on your joints while still getting the benefits of exercise and cardio. We love to walk outside but if we try to jog or do a slow run, we start to hurt. And it’s not just sore muscles that will get better, but joints that we are afraid of hurting long term. The rebounder looked like a good option because we can work out on it at whatever level we want and not have the hard impact on our joints. There are all kinds of different workouts you can do if you get bored simply jumping. One of the things we found was that a more stable rebounder was needed if you are going to be serious and rebound on a daily basis and not want to injure yourself on a piece of equipment that is not stable. Another fascinating thing we learned about is the “Health Bounce” – as opposed to jumping on the rebounder. There are some unique health benefits that we like so much that we are doing the Health Bounce for a portion of our rebounding routine every single time we step on the rebounder. The Health Bounce is essentially gentle bounces where your feet don’t leave the trampoline. You still want to pay attention to your form as you bounce: bend your knees (or you will feel the strain in your legs as you bounce), have your shoulders back and your back straight. Bouncing up and down on a rebounder lets your cells move and stretching, and as they do that nutrients are delivered to your cells and toxins are removed in a more efficient way than pretty much any other type of physical activity. It’s like an enhanced way that our body is to function that we don’t have without rebounding. From what we are learning this is so beneficial to your body that we are thinking no matter what kind of exercise or workout you do, the Health Bounce should be something you also do daily – for your cells, tissues and all your body systems. We mentioned sometimes when you try to step up your exercise you start to hurt. And then also when you do specific exercises like push-ups or lift weights, you only get the benefit of specific muscles you are targeting. What we are learning is that rebounding is a more efficient way to exercise because both weight and movement are applied to each cell in your body. The bouncing movement helps you strengthen your bones and your joints without putting extra impact on them and potentially damaging them. Rebounding is fun whether you prefer to bounce, barely jump or do a higher jump or a formal workout (there are all kinds of workouts online including on Youtube). The Today Show had a health segment a few months ago that showed a rebounding class in New York City (maybe they will become more widespread), though we prefer the convenience of having a rebounder at home and being able to jump on when we want and even multiple times per day if we have some extra minutes. Another thing is that it is just so easy to do. We like to put our headphones in and listen to podcasts or the audio from Youtube videos. Whether we are learning something new, listening to an interview conversation or some music, our time on the rebounder goes very fast. Here’s an interesting side benefit: your mental well being. Yes, exercise in general makes you feel better, but there may be some extra things going on in your brain while you bounce – we are still researching this. The good part we do know is that this is a low impact form of exercise that also gives you the same healthy-mind benefits as any exercise does. From what we have learned, pretty much everyone that can walk can use a rebounder because it is very low risk like walking. There are stabilizing bars that can be attached to the rebounder for those who need the support of holding the bar. So whatever your physical condition, you can give it a try at a level you are comfortable. At the other end of physical activity, professional athletes who are rebounders have improved their performance in measurable ways. This exercise if for everyone. Our advice is to start off slow, unless of course you have been rebounding already and want to make it more of a regular part of your exercise. Even then if you are doing it daily you might want to pace yourself. The reason we say to start at maybe 5 – 10 minutes per day, and gradually build your time, is that there is a lot going on in your body as you jump. You may even get an ache or pain somewhere because of things moving around in your body or maybe as part of the detoxifying effect. There is no set time you have to spend rebounding. Working up to 15 – 30 minutes would be great, but you can even do 5 minutes a day and experience results. Plus your total time can be done at one session, or you can jump on your rebounder multiple times per day to get all your minutes completed. Here are some of the benefits that we have learned can be achieved by rebounding: Detoxifying, losing weight, building stronger bones, building stronger joints, building stronger muscles, improving your immune system, healing faster, help with sagging skin, helping with back pain, lowering your blood pressure, improving your vision, improving your hearing, decreasing your appetite, helping you lose weight, improving your digestion, improving your brain function, giving you more energy, and helping you with feeling tired. Remember that rebounding exercises all of the cells in your entire body, and that’s what makes it so good for you. Healthy cells = healthy you. On a side note, we were so fascinated to learn about a theory where there is really only ONE REASON you get sick – with any illness or any disease. How can there be only one reason you ask? Because that reason is that your cells malfunctioned in some way. The theory also says that there are 2 reasons why a cell would malfunction: either from 1) toxins, or 2) lack of nutrients. When you rebound, your cells move and stretch and allow nutrients to get to all of your cells, and it also helps to eliminate toxins. Both benefits are huge and even though there is a little more to the story, rebounding can be huge. If your cells stay healthy, you stay healthy. Rebounding provides healthy benefits throughout your body. When you bounce, your organs, bones, muscles, connective tissue, and skin all become stronger. They become more flexible and your body is overall healthier. There is a lot of information about your lymphatic system and rebounding. From what we are learning both your blood circulation and lymphatic drainage function better. It is a personal preference, but we do like getting all these results without having to go to the gym, or even work up much of a sweat. And we do not get sore muscles and risk injury. Dr. Francis also stated that if you are going to use the rebounder daily, you need a good, stable one – not the least expensive one you can find either online or in stores (around $40-50). He said that a cheap one can do more harm to you than good because typically the springs are cheap and cannot cushion your weight. So you don’t get a solid bounce and you can experience parts of your body jarring and even nerve damage. Rebounding is a fun workout, and as we continue to learn about the benefits we will pass them along. 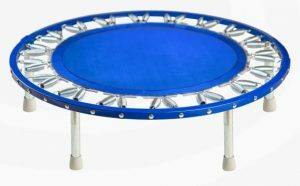 If you are interested in checking out the Needak mini trampoline, click on either of the images in this post or check them out on Amazon at: Needak Soft-Bounce Non-Folding Rebounder or Needak Soft Bounce Folding Rebounder. One of the things we are currently researching is why did the research stop on the benefits of rebounding. It appears it peaked in 1980-1983 when NASA started using it, but why didn’t more people catch on if there are all these health benefits and since it is so easy? 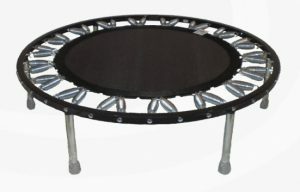 Maybe it is making a comeback – starting in NYC where there are fitness classes using rebounders. We will check it out and add to this post. There are affiliate links on this page and I have posted more about affiliate links here: Affiliate Disclaimer. A holistic chiropractor recommended a mini trampoline for me in the late 80s. I noticed many benefits from using it, but I fell away from using it. Might have to dust it off and trusts it again.